Every year, with the start of the Formula 1 season, a lot of people ask about the rules, concepts, technology and history of the sport. For that reason, Stuart Codling recently wrote a new book called “Speed Read F1”, which tries to cover the keys to understand the basics of Formula 1. If you want to find out more about this book, keep reading this review! Believe it or not, I first heard about this book on Twitter, where a considerable amount of motorsport journalists shared their excitement about the release of this book. I was curious so I decided to check who the author of this book was and I was shocked when I found out that it was written by Stuart Codling, who is a well known automotive and motorsport expert (you can find his articles in prestigious magazines such as “F1 Racing”). After that, there was no doubt I needed to get my hands on this book! Let me start the review with the structure of the publication. The book is divided in seven sections based on different aspects of the sport: Technology; Drivers; Rivalries; Racing Circuits; Flag to Finish; Staying Alive; Taking Care of the Business. From my point of view, this division is very clever and helpful for new fans and people who just want to learn the basics of something in particular. Although the book is 159 pages long, it is written in a way that encourages the reader to finish it as quick as a Lewis Hamilton’s fast lap. In addition, another thing that I particularly enjoyed is that every subsection counts with three brief paragraphs on the left margin where the reader can find interesting information about something funny, history and a person of interest (always related to the main topic of the subsection). Now, with regards to the content itself, I must admit that I got hooked from the beginning, which covers all the main technical aspects of the sport… but that may be because of my engineering background and my previous knowledge of F1. Besides, the chapter about rivalries provides amazing facts about old drivers that I never got the chance to see on the track, so I am sure almost everyone will learn at least one new thing while reading this section. Furthermore, another detail that I would like to highlight is that after each chapter, the author includes a glossary. This glossary is a very useful F1 dictionary that new fans will definitely take advantage of, mainly because it explains specific topics in a very simple way. Now you will be able to understand every word you hear during a Grand Prix on TV! That being said, I must warn you that sometimes there is a bit too much of information in a very reduced amount of words. If you are not used to scientific papers or technical books you may struggle and will probably need to read certain paragraphs a few times. Also, as a non-native English speaker, I found it curious that in the book some words are written in British English whereas others are written in American English, such as “carbon fiber” (American) instead of “carbon fibre” (British). This is nothing bad, don’t get me wrong, but it made me pay more attention whenever I read something like that, especially about materials… And I found something that is not an accurate fact about composite materials. The author, in order to provide some background, gives a definition of carbon fibre that only applies to certain types of composites… I know this is a silly comment, but I am very picky when it comes to materials science! Overall, I think it is a nice book to read if you are new to the sport or just a casual fan. However, I wouldn’t recommend it to people who have followed Formula 1 for a long time. From my point of view, this book should target an audience which is willing to get involved in this motorsport world. So, if you are one of these new fans, I definitely encourage you to get a copy of the book. After reading it (and it is very easy to read! ), “rookies” will be able to speak about most things F1 related with people who have been enjoying the sport for ages. You won’t need to be asking all sort of basic questions anymore! Last Saturday, I had the opportunity to attend a special motor show organised by McLaren at the MTC (Woking, Surrey). 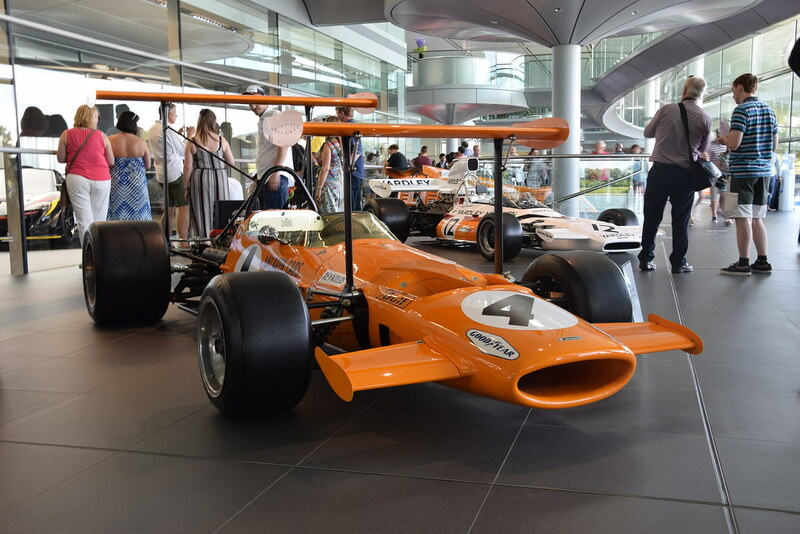 The aim of this event was to collect money for charity purposes and there, not only the legendary Formula 1 cars could be seen, but also super cars and classic vehicles which were exhibited by McLaren employees. First of all, let me start showing you the M7C, commonly known as the “Thursday car”. This was one of the first vehicles in which the company started studying aerodynamics. As a matter of fact you can see that there are two wings: one at the rear part and another one at the front. The explanation for having these two wings is easy: because of the height of the rear wing, the down force which was generated was so big that the front of the vehicle tended to take off and that gave rise to the need of another wing to combat that effect. The reason why this race automobile is known as the “Thursday car” is that it was introduced on a Thursday free practice in Monaco and it got banned for being too dangerous. Why? Well, basically because the front wing could act as a “guillotine” if an accident occurred.